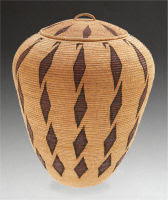 The Sept. 19, 2009 American Indian Art Auction at Heritage Auction Galleries in Dallas, will include baskets by Scees Bryant, Dat-so-la-lee and Elizabeth Hickox that are expected to command prices in the tens or even hundreds of thousands of dollars. Live and online bidding will be available. You can download a full catalog in .pdf format. The catalog includes biographies and other background information that would be helpful to any serious collector of historic American baskets.